Try the Ice Factor for indoor climbing on their huge rock wall or challenging ice wall in Kinlochleven. Canyoning Dress up in rubber and jump down a waterfall with Vertical Descents in Onich. Try mountain biking at Nevis Range. For the biggest rush, hire a full suspension downhill bike with full face helmet and body armour from Nevis Cycles, jump in the gondola and have a go at the World Cup Downhill course. If you can manage around about 4 minutes for the ride back down the hill then you might want to try entering the annual world cup race which take place on this course! Alternatively, opt for a cross country bike and have a go at the Witches Trail in the forest at the base station. The downhill sections built for the MTB World Championships in 2007 will certainly get your blood pumping! More about biking and cycling in Glencoe & Fort William. Explore some of the fantastic local coastlines with a combination of climbing, swimming jumping and scrambling, making this an exhilarating adventure. 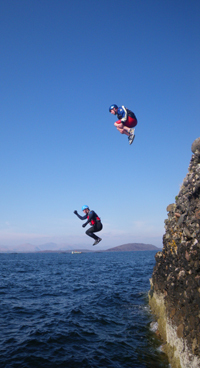 Stramash, based in Oban offer a variety of activities including Coasteering. Get on a fast Rigid Inflatable Boat with Seaxplorer. Enjoy a blast round Loch Leven or book a longer trip around the remote islands of Loch Linnhe. Take a Quad Bike tour near Fort William. Outdoor (potentially muddy!) clothing is recommended. Tours can tailored for individuals, groups and families and no previous experience is necessary. Allow just over an hour to drive from Glencoe to Kinloch Laggan. And while you’re out that way, why not have a go at a whole handful of other activities – rafting, archery, paintballing, 4×4 driving… There’s a whole lot of offer whatever the weather at Highland Activities. Aviemore Kart Raceway opened Summer 2016. The old track in Aviemore ran for over 40 years before closing in 2004. Colin Bain has now found a new sight for the Raceway and they say it is “Bigger, better and bolder than any other karting venue in the north of Scotland”. From ages 4+ with the use of their tandem carts. Allow just over an hour and a half to drive from Glencoe to Aviemore. Players fire authentic, 12-gauge shotguns, converted to fire harmless infrared laser beams instead of live rounds. There is no nasty kick-back or big bang! Learn the basics of target archery in all its practice and forms. 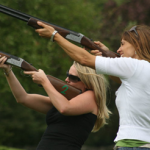 Using our bows, your instructor will teach, inform and develop your skill in this sport. More accomplished archers can test their abilities under the eye of their instructor, who will enhance their mastery of this challenging and ancient sport.